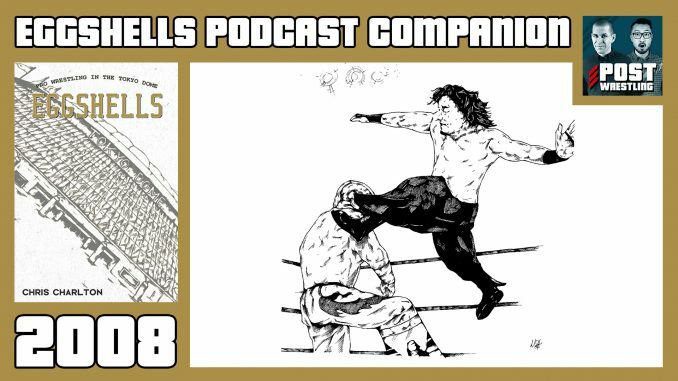 The EGGSHELLS Podcast Companion is a series of shows exploring a different year in the wrestling history of the Tokyo Dome with a different guest each episode. Episode 20 sees Chris Charlton and Wai Ting look at 2008. NJPW go from battling AJPW in the Dome to taking on TNA. Kurt Angle and Yuji Nagata steal the show, while Shinsuke Nakamura and Hiroshi Tanahashi headline. The podcast is an audio companion to EGGSHELLS: Pro Wrestling in the Tokyo Dome, available now!